Since bursting on the music scene back in 2005 with their debut album ‘The Party Scene’ All Time Low have been working non-stop building up a constant growing fan base by releasing a new album every couple of years as well as embarking on numerous headline tours, massive support slots and festival shows all across the world and it seems like they won’t be slowing down any time soon as they have just released their seventh studio album ‘Last Young Renegade’. 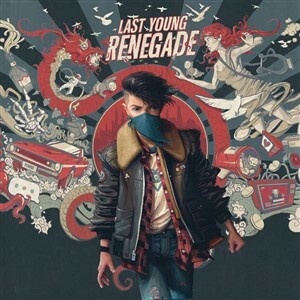 ‘Last Young Renegade’ comes two years on from the previous All Time Low album ‘Future Hearts’ and it is an album which see’s All Time Low shift their sound slightly and in a way that the whole 37 minute 10 track running of the album sounds very similar yet the album is still a pure pop-punk masterpiece with added synths and dance beats gracing the airwaves. The album opens with the title track ‘Last Young Renegade’ and as soon as the chorus kicks in you know that the next 35 minutes or so are going to be an enjoyable journey as the song has a big anthemic feel as Alex Gaskarth sings “You were my last young renegade heartache, it only took one night, caught in the eye of a hurricane, darling we had to say goodbye”, the lyrics to the song will be stuck in your head within seconds of listening to it and you will find it hard to shake off the whole bouncy groovy feeling of the song as you hum along to it for days to come. ‘Drugs And Candy’ is full of amazing synths, basslines and solid drum beats but it's the vocal journey from Alex Gaskarth which really brings the song to life as he really lets go and shows off his wide vocal range whilst taking us on an extremely infectious journey. ‘Dirty Laundry’ was the first single to be release from the album and it is easy to see why All Time Low chose to release the song as the lead single as the song is so different from anything the band have done before and is a song which is slightly more laid back than their usual pop-punk anthems and a song which uses moody synths and melodies to grab your attention, vocally Alex Gaskarth is once again on top form and towards the end of the song he sings his heart out singing “Dirty laundry is piling in her room, she’s got her secrets, yeah I got mine too, I don’t care about what you did I only care about what we do”. ‘Good Times’ is a slow paced song which a beautiful chorus which builds up over time with synths and massive drum beats gracing the airwaves. ‘Nice2KnoU’ is a big catchy anthem with huge sing-a-long chorus which is bound to get the dance floor moving at the bands future gigs. ‘Life Of The Party’ like ‘Dirty Laundry’ is so different from anything that the band have done before, its jammed packed with synths and is catchy as hell and easily up there as one of the best songs on the album. Talking of best songs on the album the song which stands out the most to me is ‘Dark Side Of your Room’, the song is a total anthem and is a song where you will find yourself wanting to dance your arse off and scream the lyrics of “With nights like these, who needs the days, I’ll shut my eyes and sleep them away, I’m on the dark of your room with the notches on your bedpost, with friends like you, who needs friends” along with Alex Gaskarth. Towards the end of the album All Time Low team up with pop superstars Tegan and Sara for ‘Ground Control’ which happens to be an really catchy pop song which is easily going to please fans of the earlier poppy All Time Low material. The album comes to a close with the beautiful sounding ‘Afterglow’. Overall All Time Low have made one of the strongest albums of their career with ‘Last Young Renegade’, it’s always a gamble for bands when after years of playing it safe they decide to mix things up and reinvent their sound but luckily for All Time Low the more mature change in sound with ‘Last Young Renegade’ really works and it makes me excited to see what direction they are going to go with album number eight which I am sure they will release in a couple of years, with the release of ‘Future Hearts’ in 2015 All Time Low were still playing the Academy sized venues in the UK whilst slowing edging up to headlining Arenas and now with the release of ‘Last Young Renegade’ it won’t be long before All Time Low say goodbye to the Academy sized venues and welcome in sold out arenas across the country and let’s face it they deserve it as they are one of the hardest working bands over the past ten years.